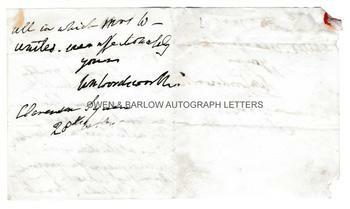 WILLIAM WORDSWORTH autograph letter Signed. ALS. 2pp. Clarenden Square. 28th Oct[ober] [no year]. To Rev. H. Hill, College, Warwick. 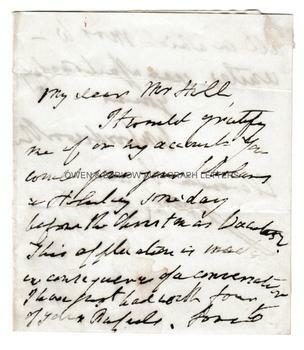 "My dear Mr Hill, It would gratify me if on my account you could give your scholars a holiday before the Christmas [vacation?]. This application is made in consequence of a conversation I have just had with four of your pupils. Love to all in which Mrs W unites. Ever affectionately yours, Wm Wordsworth." 12mo bifolium. Approx 4.5 x 3.75 inches (11.5 x 9.5 cms). Old folds. Old mounting residue to corners of verso of last leaf. All else near fine. 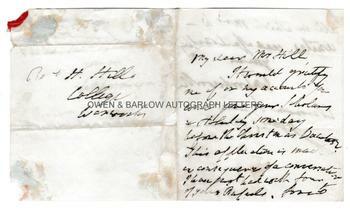 The Reverend H. Hill was the nephew of Robert Southey, who had preceded William Wordsworth as poet laureate. Provenance: From the 19th century album compiled by the family of Dr James Copland (1791-1870), the Scottish physician and eminent writer on medicine.